Endemic to a very small area of the Djebel Babor Mountains in northern Algeria where it is threatened by a combination of fire, fuel-wood collection and grazing by cattle and goats. 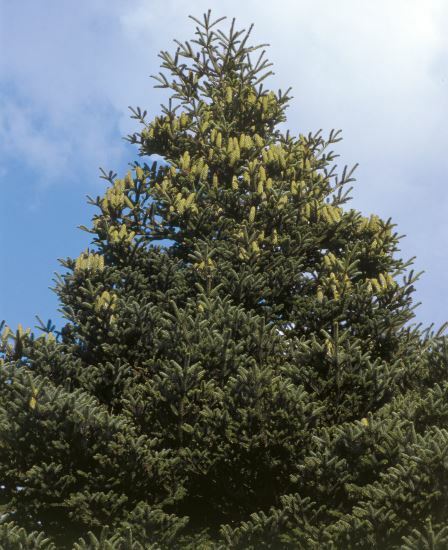 Tree up to 20m tall, dbh 0.5‒1m; crown broadly pyramidal, dense and irregular when old. Bark fissured and scaly, dark grey brown when old. Lower branches sweeping down, middle branches horizontal, upper ascending. Vegetative buds ovoid or broadly conical, not resinous. Leaves spirally arranged all round shoot, shaded foliage parted, 15‒20 x 2‒3mm, twisted or curved at base, linear, flattened, keeled with a prominent midrib below, glaucous green, stomata whitish complete bands below and a large patch near the apex above and tapering down the mid-line, apex obtuse. 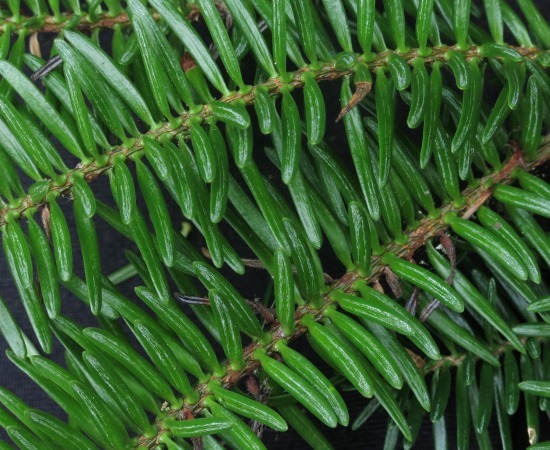 The name Abies numidica is the most widely accepted name in use in modern-day publications; Farjon (2001) and Farjon and Page (1999). 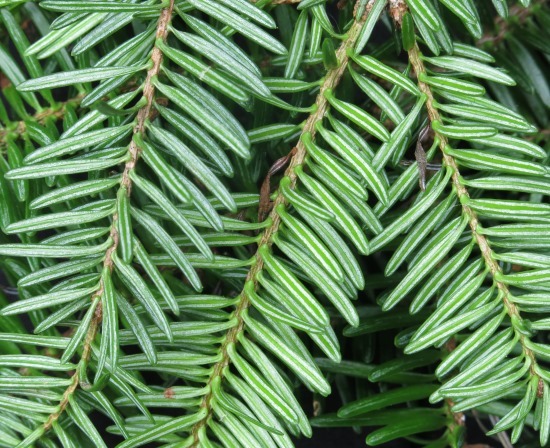 Rarely is one of its older synonyms used although the name Abies pinsapo Boiss. var. numidica (de Lannoy ex Carriere) Solomon has recently been used by Eckenwalder (2010). Located on Mt. Babor and Mt. Tababort, in the Djebel Babor Mountains which forms part of the Petite Kabylie Mountain range in Algeria which runs parallel to the Mediterranean coast. Most reports give the extent of occurrence (EOO) of the Babor forest as ca.23.67km² in which Abies numidica has an EOO of 2.5km². However a specially commissioned study of the forests (Technoexportstroy, 1970) gives the overall forest as 27.3938km² and the Abies component as low as 0.8188km². Although the area of occupancy is not known it is assumed to be less than 1km². Knowledge of the population is very poor due to the fact that access to the area is highly restricted because of national security problems. Occurs in humid montane mixed forests on north and east–facing steep calcareous slopes. The climate is particularly humid and cold, with annual precipitation of 2500 mm, much of which falls as snow during the winter. The summers are dry and typical of a Mediterranean climate with an average of 18°C and a winter minimum of -1°C, with extreme frosts of between -8 to -10°C (Gharzouli, 2007);5 however the northern slopes tend to be wetter due to their proximity to the coast. The annual rainfall is between 1500–2000mm. 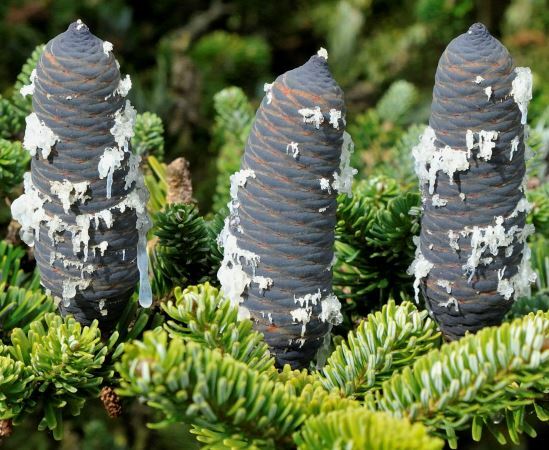 Abies numidica has an altitudinal range of between 1850–2000m. Typically they cover the mountain summits where they occur as pure stands (rare) or are co–dominant with Cedrus atlantica, Quercus faginea, Acer obtusatum, Populus tremula, Sorbus aria and S. torminalis with the occasional tree of Taxus baccata. Shrubs include Adenocarpus complicatus ssp. commutatus, Daphne laureola, Lonicera kabylica, Ribes petraeum (rare) and Rosa sicula. There is a rich herbaceous flora which includes: Asperula odorata, Moehringia stellariodes, Paeonia corallina, Senecio perralderianus, Viola munbyana, Silene atlantica, Silene patula. Alyssum spinosum, Anthyllis montana var algrica, Catananche montana, Erinacea anthyllis, Ononis aragonensis, Pimpinella battandieri are more characteristic at the highest altitudes very close to the mountain summit (Gharzouli 2007).5 These forests are not only an important habitat for many endemic plants species but also for birds and animals which have very narrow ranges such as the Algerian Nuthatch (Sitta ledanti) and the Barbary Macaque (Macaca sylvanus). The total extent of occurrence (EOO) of forests containing Abies numidica is estimated to be less than 30km². 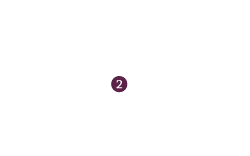 The actual area of occupancy (AOO) is estimated to be less than 1km² (8km² using standard IUCN methodology). Even though the area is protected by a National Park, there has been a continual loss in EOO, AOO and a decline in the quality of habitat due to a combination of factors including fire, fuel-wood collection and grazing by herds of cattle and goats in the summer. It appears that the young saplings are unable to establish due to a dense under-storey and deep winter snow. The threats to the forest and endemic species are presumed to be ongoing, although the difficulties of access to the site (especially in winter) afford some degree of protection. The forests of A. numidica are within the Djebel Babor Nature Reserve (upgraded from a Natural Reserve in 1985). Entry to the Reserve is carefully controlled and the area is guarded by wardens to try and prevent timber extraction, hunting and grazing. A number of specific conservation proposals have been suggested and relevant authorities are said to be very supportive of action to protect the site, but no more recent information is available regarding its current status and management. The various actions proposed included a reduction in the levels of fuel–wood exploitation, habitat management including selective tree-felling, reforestation and supplementary planting in areas of cultivation, restrictions on grazing in certain habitat–types, surveillance, visitor management and prevention or control of forest-fires. 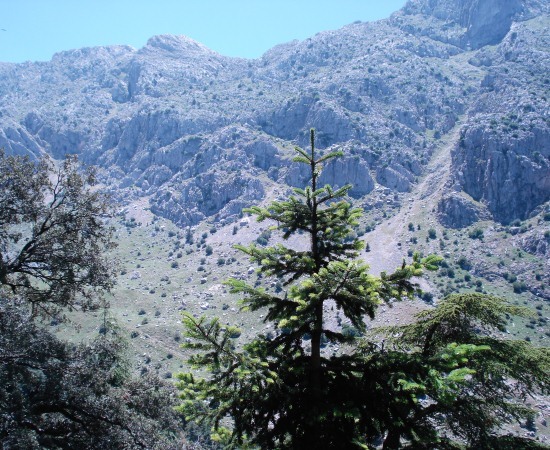 In Djebel Babor, the number of Abies numidica trees has decreased by half since the 1950s (World Wildlife Fund, 2011).,Although there are plans to make the area where Abies numidica occurs into a national park and a report has been produced, nothing has been implemented to date. Eckenwalder, J. (2010). Conifers of the world: the complete reference. Timber Press, Portland, London. FAO Forestry Department. (1986). Databook on endangered tree and shrub species and their provenances. FAO, Rome. Gharzouli, R. (2007). Flore et végétation de la Kabylie des Babors etude floristique et phyttosociologique des groupements forestiers et post–forestiers des djebels Takoucht, Adrar Ou-Mellal, Tababort et Babor. Faculté des Sciences, Département de Biollogie, Université Ferhat Abbas. Gharzouli, R. and Djellouli, Y. (2005). Diversité floristique de la Kabylie des Babors (Algérie). Sécheresse. 16(3): 217-223. Maire, R. (1952). Flore de l'Afrique du Nord. Paris. Technoexportstroy. (1970). Parc national du “Babor”. études préliminaires . rapport définitif. Sofia, Bulgaria. World Wildlife Fund. (2011). Mediterranean conifer and mixed forests In: Encyclopedia of Earth. Eds. Cutler J. Cleveland (Washington, D.C. : Environmental Information Coalition, National Council for Science and the Environment). 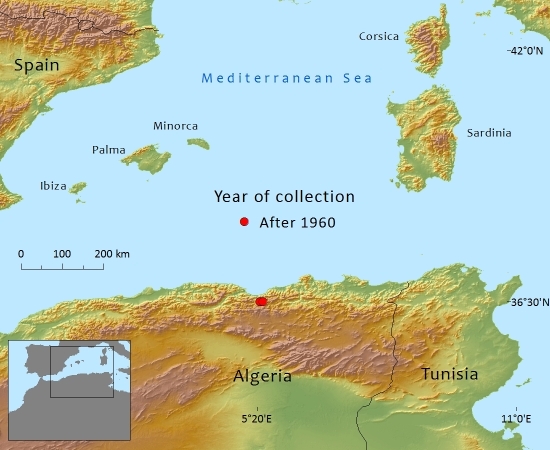 [First published in the Encyclopedia of Earth March 2, 2007; Last revised Date February 6, 2011; http://www.eoearth.org/article/Mediterranean_conifer_and_mixed_forests?topic=49597>. (Accessed: 15 May 2010). Yahi, N., Knees, S. & Gardner, M. (2011). Abies numidica. In: IUCN 2012. IUCN Red List of Threatened Species. Version 2012.2. . Downloaded on 07 March 2013. N.Yahi,S.G.Knees,and M.F.Gardner, 2016. Abies numidica, from the website, Threatened Conifers of The World (http://threatenedconifers.rbge.org.uk/taxa/details/104).